White Rabbit! White Rabbit! White Rabbit! Welcome to the 1st day of October 2015 where we shall try to gallantly put a stop to all things that are bad. Bad things are slowly turning our world into a morbid sphere of slow destruction, cutting away vital life forms from basic organisms to augmenting anger of men and women in all corners of the globe. 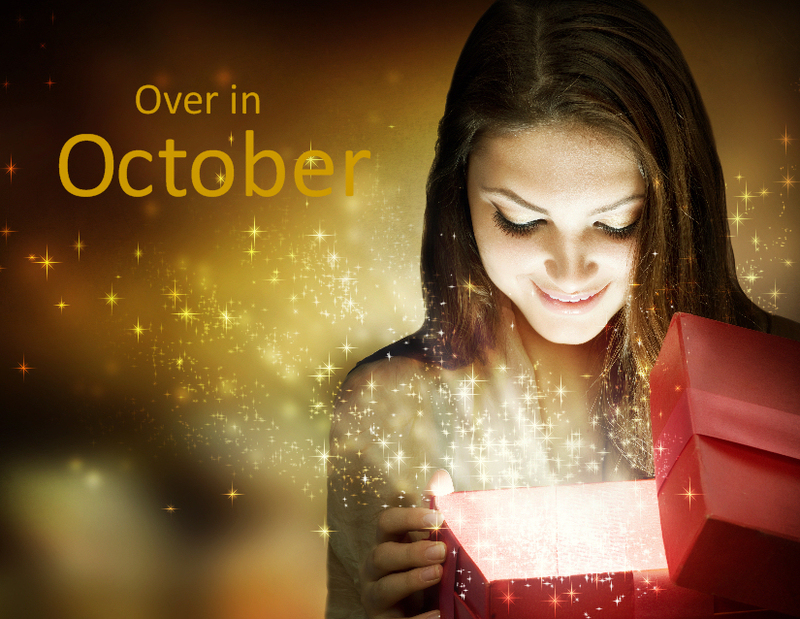 In October 2015 we need to open new doors in our lives to let the flow of happiness and joy to enter once again. Happiness is such a wonderful realm of comfort to be in. It is like floating on cloud 11. Happiness brings contentment to one’s heart and soul and makes worries disappear overnight. Yes, we can make the adversities of life disappear at the snap of a finger. We can if we are willing to try. Where there is aridness a drop of rainfall is all that is needed. Where there is hunger a morsel of breadcrumbs is all that is asked for. Where there is hate that turns men into bloody machines love can quite easily undo. Where there is financial hardship a penny is worth so much more. Where there is death there is life. Where there is life there should never be the thought of death but the will to live onto eternity. Where there is abuse we need to wipe it off the slate of our existence with kindness, tenderness and gentleness. Where there is a sense to divorce we need to have the sense to reinforce our values and our goodwill. Where there are children there is the presence of life in abundance. Where there is illiteracy education must come first. Where there is a surplus of anything big or small we must learn to give away to others that always live with a deficit no matter how big or small. Where there is anger we must exercise management of our temperament and of our senses. Where there is lust we must have the courage to be just and to develop trust. October is the month to put an immediate stop to all things that are graded badly. The list to bad things are too enormous to list in this article but whatever your definition of bad things are it will be included in the list. October is the month to start a new life by choosing all things that are graded well. You can tell good from bad quite easily. Good things are generally good and manifests in an individual as a sparkle of unique decency, respectability, morality, righteousness and virtuousness. Great men and women have paved a road of righteousness for others to follow and are constantly leaving similar footpaths for newer generations to follow. Bad things are always bad manifesting in the streets and in our homes as evil, wicked, corrupt, immoral and ruthless. Bad things are happening daily in countries like Syria, Somalia and Zimbabwe. Good things always end up as how it should be with flowers to bloom, fruits for the plucking and grasslands greener than ever. Bad things always end up in a feud, in war, in irony, in death, in conflict, in bitterness, in rivalry and in competition. Dear Friends, as I write to you today and thank you for finding time to read my words I cannot tell you how important it is to be good. I cannot tell in words the effectiveness of being good really is but I do know that it is enjoyable, pleasant and really nice. You cannot be successful if you have a taint of badness in you. Badness is like a viral or bacterial infection. If you do not control it, it will control you. Good things in life hold an esteem of greatness. Men and women over the generations have a left behind a legacy of good deeds for us to follow. Where did they acquire these altruistic skills? They got them from The Master himself who taught it well in the auditorium of The Creation. With just 91 days to the start of a new revolution around the Sun I urge you to share a live of goodness. Have a wonderful start to October and make a firm decision to put a stop to all things that make your life less happy. I am here to help. Call me your Mentor, you Modern Day Guide or your Inspirer. All I can say is that I shall always be your friend that holds your hand to guide you along the footpath to righteousness. Dear Friends let us embrace this month with a new ideology and that is love, genuine love. Yes, I am talking about the affection for the animals, the adoration for the flora, the friendship for all, the tenderness for your loved ones, the feelings for the needy, the fondness for the seedy, the devotion for Almighty GOD, the passion for your goals, the desire for your actions and the enthusiasm to get up each day to get the job done. Yes, I want you to love to live your life despite the many trials and tribulations that scars your mind and your body. Today I want you to start anew like a shoot that emerges from the Earth and watches the world from below. What are the chances for this shoot to survive? It will survive because it has being coded with the knowledge to survive. It wants to live like you to grow into a tree and to carry its own history for the world to read. If you are willing to accept this then you shall be anointed with a new vision, to start your life from today like never before. Can you imagine waking up to the sound of desire and passion? Have you ever tasted the authentic feel of passion and desire? Passion is the hunger to succeed. It should be like an early morning paroxysm that drives you out of bed to accomplish rather than to procrastinate tucked into your eiderdown. Desire is your earnest and personal wish described in your own words and feelings, written with aspiration and undertaken with motivation. Can you imagine yourself free from debt, free from threat, free from sweat and certainly without fret? In October we want all these negative feelings to be over. Yes, Over in October. I want you to start fresh. I want you to have a vision of your future in a world filled and teeming with opportunities. I want you to dream your future and to taste it by experimentation. I want you to carry this mental picture with you every single day from now on, the start of your era. I want you to fit into the shoes that you feel comfortable in and walk a journey across deserts, mountains, chasms, caves, undergrowth, overgrowth, forests, savannahs, marshes, ghettos, slums and natural disasters without fear, without a morsel of tear, without a sneer, without the slightest sear but instead with a bright cheer, unmistakeably clear with the sheer delight of having to love your life. People have let you down but from on you need to uplift yourself. You need to shred those gremlins that lurk under the skirting board, which makes repeatedly your day dismal and abysmal. I want you to submerge into new knowledge and emerge from it acknowledged and wiser. Let the 31 days in October be used wisely. Us it to overcome those addictions, and to trample those contradictions and to annul those saddened convictions of guilt and to augment those convictions that broaden your belief. You can do it but you need to believe. You need to believe in yourself. You need to believe that you can achieve your dreams. You need to believe in the whole concept of believing. You need to consider all and to and the confidence in every living organism let alone every human being. This is the hallmark of true faith. Faith stops wars. Faith creates Friendship. Faith confirms your longevity. Faith brings you comfort, joy and happiness. Faith is like living matter or a medium if sat upon will carry you like the planets and satellites into daily rotational orchestrated movements that is precise and twice as nice. Love your life. Love it more than anything else and from it reap the rewards for your constant gallantry and your concerted efforts. With love from Anthony, a person that cares, shares and remains fair.